Perfectly accompanied by a huge mug of coffee or a tall glass of cold milk, these cookies are subtle but delicious… and extremely simple to make. In a bowl, sift together the flour, baking powder and salt; set aside. Place the chocolate in the top of a double boiler over hot, barely simmering water. Heat, stirring often, until the chocolate melts. Remove from over the water and set aside to cool slightly. In a large bowl, combine the butter and sugar. Beat on low speed until blended. Add the dry ingredients and mix until incorporated and the dough is smooth. Divide the dough in half. Put one half of it in a separate bowl and stir in the instant coffee (dissolved in 1 teaspoon hot water). Add the melted chocolate and cocoa powder to the dough remaining in the large bowl and mix on low speed or with a wooden spoon until blended completely into the dough. Gather up each portion of dough, form each into a 5″ square, and wrap separately in plastic wrap. Refrigerate until firm, about 45 minutes. Remove the dough from the fridge. One at a time, place each portion between 2 sheets of waxed paper and roll into a 10″ x 5″, 1/8″ thick rectangle. Remove the top piece of waxed paper from each. Beat the egg white in a small bowl until foamy. Brush it lightly over the top surface of the chocolate dough. Using the waxed paper, flip the chocolate dough onto the coffee dough and press together. Peel off and discard the top piece of waxed paper. Trim the dough edges evenly and roll up the 2 layers of dough into a tight log, removing the remaining piece of waxed paper as you roll. Gently press the seam along the length of the roll to seal it. Trim the ends evenly (roll should be about 9 inches long). Wrap in plastic wrap and refrigerate until firm, at least one hour or overnight. Position rack in the middle of the oven, and preheat to 350 F. Line 2 rimless baking sheets with parchment paper. Unwrap the dough on a cutting board. Using a large, sharp knife, cut the dough crosswise into ¼” slices. 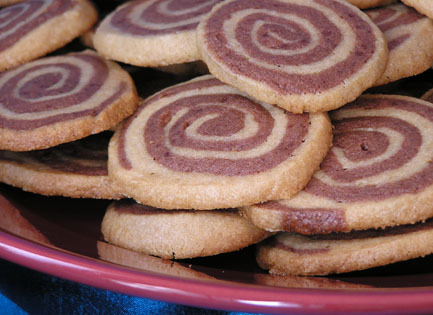 Place them 1″apart on the prepared baking sheets. Bake, 1 sheet at a time, until the edges just begin to turn lightly golden, 8 – 12 minutes. 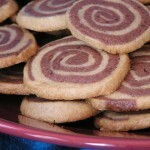 Let the cookies cool on the baking sheets for 5 minutes, then transfer them to wire racks to cool completely. Store in an airtight container at room temperature for up to 5 days.